I believe that many of these honey bees products isted here are probably what you have already encountered on the shelves at one point or another during your shopping trips, but you may never really know what they are and what benefits they offer, or perhaps you may have never really stopped to take a second look at them. These seven very common products from the honey bees and their amazing benefits will make you realise (as they have done to me) how indebted we humans are to these tireless creatures and the extent which their products are underused, understated, and sometimes even misunderstood. Bee pollen is not the same as allergy-causing pollen that is carried by the wind. It rarely causes allergy symptoms. It is actually the male seed of a flower blossom which are collected by the honey bees and mixed with the bees' digestive enzymes. Bee pollen is low in calories but rich in proteins, amino acids, vitamins, minerals, enzymes, beneficial fatty acids, carbohydrates, and bioflavonoids which are anti-viral, antibacterial and helpful in lowering cholesterol, stabilising and strengthening capillaries. Its ability to rejuvenate the body, stimulates organs, enhances vitality and accelerate rate of recovery makes it a popular tonic among athletes and sportsmen. Click here to read more on the benefits of bee pollen. Bee wax or beeswax is a natural secretion from wax glands on the sides of the body of honey bees and is used primarily as a building block for the bees' honeycomb cells in which the young are raised and honey and pollen are stored. To stimulate the production of beeswax, the honey bees feed themselves with honey and huddle together to raise the temperature of the cluster. The uses of beeswax are found in numerous products, including skin care products, candles, furniture polish, batik-making,etc. Follow this link to read about the usefulness of Bee Wax. Royal jelly is the queen bee's extraordinary source of food. It is a blend of secretions from the salivary glands of the worker bee and contains a high concentration of vitamins B5, B6, and amino acids and is believed to be a potent antioxidant a special rejuvenating substance that promotes tissue growth, muscle and cell regeneration. Discover the wonders of Royal Jelly. Honey bees collect sticky resins that ooze from the buds of some trees and conifers. After chewing them and mixing them with their saliva and other substances, Propolis or sometimes called "sticky glue" is formed. Propolis is of vital importance for the survival of the honey bees in the beehive. Not only does it protect them against diseases, it also helps fight against climatic changes, such as wind and cold. Because of its antibacterial, antifungal, antiviral, anti-inflammatory and antioxidant effects, Propolis has been shown to have outstanding value for a wide variety of illnesses. It is also used as ointments for healing cuts and wounds. For a more detailed account on propolis and its use, read this article: Health Benefits of Propolis. When I first saw organic honey on the shelves and its big price tag during my grocery shopping, I always wondered what it was and how different it was from the rest of honey varieties. It was only later that I found out that for honey to be certified organic, the manufacturer has to meet a set of very stringent organic standards and conditions during the honey production (set by a organic agriculture certification body), which include source of the nectar, honey bees foraging area, bees management, honey extracting process, transportation, processing temperature, and packaging materials. Click here to read more on Organic Honey. Mead, simply put is honey wine. It is the first alcoholic drink brewed by men, earlier than wine or beer. Today mead has evolved and expanded its flavours to include fruits such as blueberry and cherry, malt as well as various herbs and spices. For a basic introduction on mead, read: Mead. What an interesting name, right? Bee bread is actually the main source of food for most larvae and bees. It is fed to all larvae except those that are selected to become queens; the queen larvae are fed royal jelly instead. Comprised of all essential amino acids, high contents of vitamins especially vitamin K, enzymes, and flavanoids, bee bread is made of pollen mixed with bits of honey, bee wax, and bees' digestive enzymes and is known to be useful in treating anemia, hepatitis, insomnia, stress, failing memory, cholesterol and disgestive tract disorder. Nowadays, it is rare to find bee bread. Occasionally, you may find a honey specialty shop carrying bee bread specially made for promoting kids' physical and mental growth, improving memory, and weight gain. You will have a higher chance of getting it direct from the bee farms and beekeepers. End of "Honey Bees and Their 7 Wondrous Products (#7 is Pretty Unheard of)". 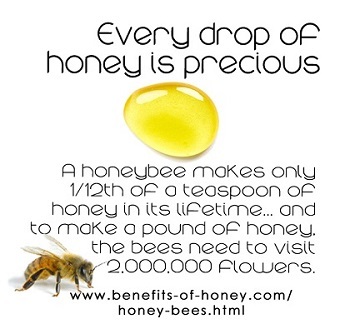 Back to "20 Wonderful Honey Bee Facts (#8 is Surprising)"